Atlanta GA is the fastest growing, most diverse city in the South Eastern USA. The Metro ATL has hundreds of thousands of homes that have in-ground pools, many of which are constructed with vinyl pool liners. Inevitably they need maintenance and replacing after several years. That’s where we come in at Paradise Pool Services. We are the #1 choice for pool liner replacements in Atlanta! If you own a swimming pool in Atlanta GA and need professional repairs, you’re in the right place! Paradise Pool Services, LLC has been installing and replacing pool liners, performing major pool renovations and completing minor pool system repairs for over 30 years. Between our Atlanta swimming pool customers and others throughout Metro Atlanta, we’ve installed thousands of in-ground vinyl pool liners and completed quite a few major pool make-overs. We can also help with your yearly pool opening and pool closing. When it comes time, we have a 7-point inspection that includes checking out your entire swimming pool system. We include this on any pool opening job. This season may be the best time to convert to a salt water pump system, so be sure to ask us about it. 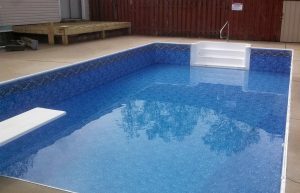 Paradise Pool Services, LLC has been serving the Atlanta area for over 3 decades. During that time, we’ve cultivated great working relationships with our suppliers. This helps us to get top quality products at the best prices. We then pass the quality and savings along to our customers. Isn’t that how it’s supposed to be done? It’s time to get the pool back to pristine condition. Contact Paradise Pools today to schedule your Free poolside quote. We can help with any pool repair or renovation you may be needing. Paradise Pool Services does just about every swimming pool service under the sun. It doesn’t matter what you may be needing for your Atlanta swimming pool, we’ll restore it to like-new condition, ready to entertain guests.